The amazing display of peacock's feathers. 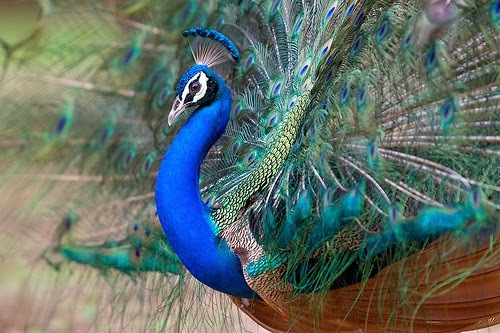 For most of the peoples will agree to say that peacock will be among the most beautiful bird in the world. 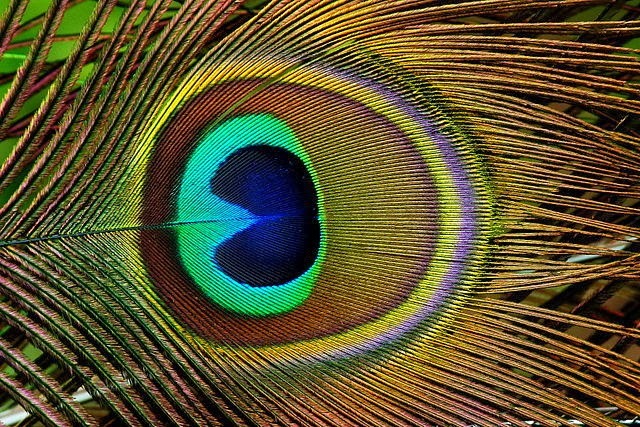 Despite of their natural glimmering colorful feathers they also can turn into stunning showcase of huge beautiful fan. You’ll find them more beautiful when you meet them during this showcase. Beautiful colors of peacock consist of many colors but most of the time we will see them in blue/green in mixing. There also have brown in color feathers under their wings and under their body. Their colors turn with the direction of light hitting it so you can see more colors in between. This type of coloration also exists for some other birds and insects. The beauty colorful feathers only for the male and the female have natural ordinary colors. The female also little bit smaller in size. It always the male who has the beautiful colors in order to attract female in nature, only in some species of birds where the females has the brighter colors than the males. So the showcase is all about for attracting purpose too. Since peacock has very heavy feathers they also can’t fly as high as any other birds. Perhaps their little leap helps them to get away a little bit further from their predators. In most of the places where they live peoples always admires for their beauties and use their feathers for decoration purposes. They also often rose for their feathers.